This plan's charming Cape Cod exterior welcomes you to a well-planned interior that accommodates both formal areas and casual spaces. The large family room with fireplace opens onto an inviting sunroom with rows of windows and a bank of ventilating skylights. Out back, the custom-shaped deck with seating expands living to the great outdoors. The roomy kitchen features center-island cooking, with ample counter and cabinet space. A bay window in the breakfast room creates panoramic scenery for casual meals. For more formal meals, the dining room is an excellent place to entertain, and across the foyer, the living room is ideal for after-dinner conversation. 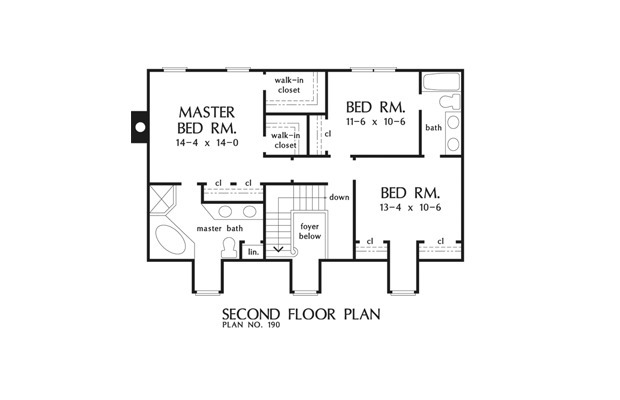 Upstairs, the master bedroom suite features a whirlpool tub, double-bowl vanity, separate shower and two walk-in closets. The two other bedrooms share a bath and each have ample closet space. 1st Floor: 1401 Sq. Ft.
House Dimensions: 79' 4" x 31' 10"
Great Room: 16' 8" x 14' 0"
Foyer (2 Story): 7' 6" x 9' 10" x 17' 1"
Dining Room : 13' 4" x 13' 4" x 8' 0"
Great Room : 16' 8" x 14' 0" x 8' 0"
Kitchen : 13' 4" x 14' 0" x 8' 0"
Breakfast Room : 8' 8" x 12' 2" x 8' 0"
Utility Room : 6' 0" x 9' 0" x 8' 0"
Master Bedroom : 14' 4" x 14' 0" x 8' 0"
Bedroom #1 : 13' 4" x 10' 6" x 8' 0"
Bedroom #2 : 11' 6" x 10' 6" x 8' 0"
Porch - Front : 7' 0" x 4' 0" x 0' 0"
Deck / Patio : 43' 0" x 10' 0" x 0' 0"
Living Room : 14' 4" x 13' 4" x 8' 0"
Other : 12' 0" x 14' 0" x 8' 0"